At altitudes of 15,000 feet, Tibetans live in environments that would incapacitate most humans. New research has uncovered several genetic mutations that appear to be responsible for these high-altitude superpowers—including a trait inherited from an extinct human species. Geneticist Chad Huff of the University of Texas, along with colleagues, have uncovered variants of five distinct genes that enable Tibetan individuals to live and work in the Qinghai-Tibetan Plateau, an elevated stretch of land that extends across Central and East Asia. 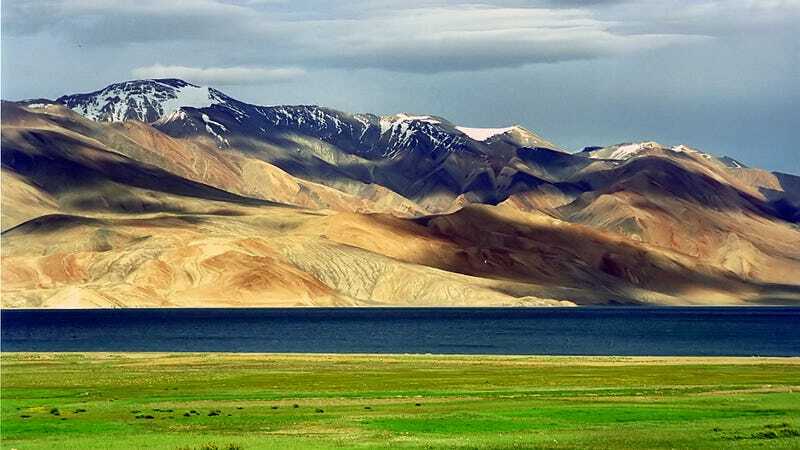 Known as the “roof of the world,” this plateau features an average elevation exceeding 14,800 feet, an expansive arid steppe, mountain ranges, and large brackish lakes. It rarely rains, but when it does, it tends to come down as hail. Humans have lived in the Tibetan Plateau for thousands of years, and as the new PLOS Genetics study shows, natural selection has been busy at work on these populations, endowing them with a genetic profile specific to this environment. Huff’s team uncovered gene variants that allow Tibetan individuals to withstand low levels of oxygen and limited access to food. Incredibly, one of these genes, called EPAS1, is inherited from the Denisovans, a mysterious subspecies of human that disappeared some 40,000 years ago. Consequently, this study is not just informing us about Tibetan history and physiology—it’s also telling us something about a human species we know very little about. Most humans aren’t built to live in the mountains. Once above 7,000 feet, and typically above 13,000 feet, many of us will start to develop chronic altitude sickness, with the decrease in atmospheric pressure making it difficult to breathe, leading to headaches and nausea. More severely, some people develop high altitude pulmonary edema (HAPE), which can result in swelling and itching in various parts of the body, hemorrhages, and even heart failure. It’s hard to believe that people would choose to live in such a harsh environment, but as Huff told Gizmodo, “Humans will go and live anywhere they can.” And given enough time, with the aid of Darwinian natural selection, the populations who do live in these environments will start to change. For the study, the researchers sequenced the whole genomes of 27 Tibetans. As they looked for advantageous genes, Huff’s team flagged two that are already known to confer adaptations at high altitudes, namely variants to EPAS1 and EGLN1. Both of these gene variants are activated when oxygen levels are low, triggering production of more hemoglobin—a protein in red blood cells that carries oxygen throughout the body. These genes stave off hypoxia, a dangerous condition that happens when the body is deprived of oxygen. But the researchers also found variations to three human genes that hadn’t previously been associated with high altitude adaptations. Two of these genes, PTGIS and KCTD12, have been shown in prior studies to be related to low oxygen levels and hypoxia, while VDR is known to play a role in vitamin D metabolism. Tibetan nomads are susceptible to vitamin D deficiency on account of their limited diets, and the VDR gene compensates for that. All of these gene variants, except for EPAS1, emerged through mutations among the ancient Tibetans. The fact that Tibetans inherited an apparent high altitude gene from an extinct subspecies humans is a potential clue about what these poorly understood people might have been like. Frustratingly, the only thing we know about the Denisovans comes from the genetic information extracted from a lone finger found in a Siberian cave in 2010. These hominins were more like modern humans than Neanderthals, and represent a potential subset of Homo sapiens. What’s more, the presence of the EPAS1 gene among the Denisovans would seem to suggest that they, like the ancient Tibetans, lived in the mountains. Huff’s genetic analysis suggests that a population diverged from the Denisovans between 952,000 to 238,000 years ago, and mixed with an ancient population of Tibetans. The EPAS1 gene entered into the Tibetan population between 12,000 and 32,000 years ago, and positive pressure on the gene emerged some time between 7,000 and 28,000 years ago. The researchers estimate that 0.4 percent of Tibetan genome comes from Denisovans, but EPAS1 is the only gene that was reinforced by strong selectional pressures among the ancient Tibetans. Incredibly, it took Tibetans only a few thousand years (perhaps as little as 3,000 years) to acquire their high altitude traits; for these ancient mountain dwellers, evolution worked fast. Moving forward, the researchers would like to study the newly identified genes in more detail to get a better understanding of how they help in high altitude environments. They’d also like to study the Andean people who, like the Tibetans, have also evolved high altitude adaptations, though not to the same extent.